VintageApollo space missions tapes uncovered at a university in Western Australia are not what a teamof experts are trying to locate. "Thesearen't the tapes we're looking for," said John Sarkissian, operations scientistat the Commonwealth Scientific and Industrial Research Organization's (CSIRO)Parkes Radio Observatory in Parkes, Australia. 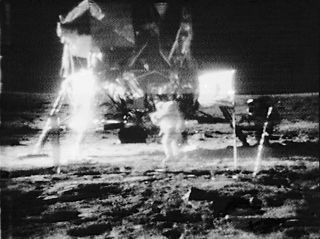 Thestory that is now making the rounds, Sarkissian added, refers to copies ofone-inch magnetic tapes recorded at the Carnarvon station in Western Australia.They contain data from Apollo 11's Early Apollo Surface Experiments Package(EASEP)-a set of scientific instruments emplaced at the Apollo 11 landingsite by the astronauts. EASEPwas the forerunner of what was called the ALSEP experiment packages, short forthe Apollo Lunar Surface Experiment Package and used on the later Apollomissions. Stillat issue is the location of Apollo 11 Slow-Scan Television tapes (SSTV). [See story.] Those lost tapes could give the world a better view of thefirst human explorers as they walked upon the Moon more than three decades ago. TheSSTV recordings were of better quality than scan-converted imagery that-whilefuzzy and far from crisp-enthralled a global audience of Apollo 11 moon watchersback here on Earth. Byrecovering the SSTV, the hope is to provide the public a higher-quality, upgraded21st century look at the exploits of Neil Armstrong and Buzz Aldrin-the lunartwosome that first set boot on the Moon back in July 1969. Ateam of experts-both inside and outside of NASA-continue on their quest topinpoint the Apollo TV tapes in question. Regardingthe on-going search for the Apollo SSTV tapes, Sarkissian added that "there'snothing new to report...unfortunately." The team in the United States is very deep into checking the various places the tapes may have beenarchived, he said. "Butwe haven't yet found anything. There's been a lot of paper work uncovered, butnot the tapes," Sarkissian reported. Whilenews headlines talk about "lost Moon landing tapes" the actual tapes recently foundwere neither lost nor of the Moon landing, explained Bill Wood, a retiredApollo tracking station engineer in Barstow, California. Woodis also part of the group that's on the hunt for the SSTV recordings, offeringtechnical expertise gleaned from his background in supporting all of the Apollomissions at Goldstone-part of NASA's worldwide network of deep space antennasrun by the Jet Propulsion Laboratory (JPL) in Pasadena, California. Woodreiterated that what was found were data tapes from the Apollo 11 EASEP packageleft on the Moon by the Apollo 11 astronauts. "NASAhad the cooperation of many colleges and universities around the world toanalyze data from the data packages left on the Moon," Wood advised. "SinceNASA had a very close relationship with the Australian government in support ofApollo, the University of Sydney was supplied copies of EASEP and ALSEPtelemetry data as part of the effort to learn more about the Moon." Woodsaid that NASA still has detailed recordings of all the EASEP and ALSEP packagesfrom activation until their respective nuclear power supplies were exhaustedabout 30 years later. They have not found the tapes, Wood told SPACE.com. "But, we are running down every lead." Theinquiry into the whereabouts of the SSTV tapes has not proven easy. Budgetcuts at NASA in the post-Apollo years meant that many day-to-day records werediscarded. Jobs and entire divisions that dealt with data records wereeliminated. Sincethere was no official requirement to archive data like this, Wood added, the SSTVtape could have gone the same way that many old television programs did: TV stationsdegaussed the tapes and reused them. "But,no conclusions yet," Wood said. He noted that he spends most of his timecalling one person after another to get tips about other people to contact.However, many of the individuals involved from long ago have passed away,making the task more difficult. "Itis taking contacts with retirees and others who were involved at the time tofigure out what happened," Wood concluded. "So the search continues."